Tokyo, August 19, 2013 – Subaru Tecnica International Inc. (STI)*1 today announced the release of the "SUBARU BRZ tS" which goes on sale on August 19 through Subaru dealerships in Japan. The inherent handling performance of the Subaru BRZ has been further enhanced by using expertise developed in motorsports while achieving the "strength and nimbleness" driving committed by STI. 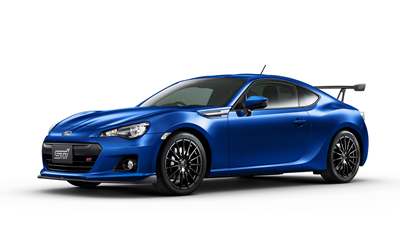 The "SUBARU BRZ tS" offers a driver "oneness with vehicle" and "agile handling pleasure". Exclusive tuning such as the adoption of a large-diameter driveshaft and STI's unique flexible parts embodies superior handling performance. Driving performance has also been enhanced by the adoption of "brembo" ventilated disc brakes, 18-inch aluminum wheels and a STI designed front under spoiler. The model comes with special features including the "STI" / "tS" ornaments and exclusively-made fender garnish on the exterior as well as a speedometer with an STI logo inside, which evoke driving excitement and pleasure of ownership. In addition, "GT PACKAGE" model which is suitable for motorsports enthusiasts is released. The model features a STI designed dry carbon rear spoiler, black colored "BBS" designed 18-inch aluminum wheels and "Recaro" designed front bucket seat. *2: Sound Creator® is the registered trademark of MAHLE Filter Systems Japan Corporation.